There were two ballot measures on the November 6, 2018 ballot. Approval of both measures was necessary to support funding for a new and larger library. Only one measure was approved. Read more about the ballot measures. . . The current Sequim Branch was built in 1983 to serve a population of approximately 14,000. Now serving a population of around 30,000, the Sequim library is still only 6000 square feet small. Since 2014 a larger, modern library for Sequim has been a top priority for NOLS. Significant time and funds have been expended toward project planning, community engagement, and ballot measure development. Sadly, in November 2018, a bond measure that would have supported construction of a new and larger Sequim Branch narrowly failed to meet the 60% majority required for passage. The cramped and outdated Sequim Branch remains a pressing concern for NOLS, but after careful consideration of many factors, the Board ultimately decided to step back from active work on the Sequim Future Library project until at least 2021. NOLS wants to build the Sequim Branch that reflects the community’s vision of your Future Library. Community involvement NOLS has participated in or hosted numerous public events, ranging from informational presentations to hands-on interactive design workshops. NOLS has also stayed closely connected to community partners and other local agencies, and fielded multiple community-based taskforces and committees in connection with the planning project. 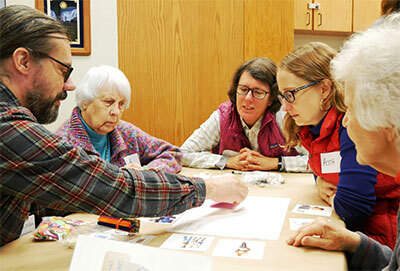 NOLS staff, particularly the Sequim Branch staff, have been involved in planning, as have other Library stakeholders. NOLS and SHKS Architects worked with the community on needs assessment and conceptual planning. 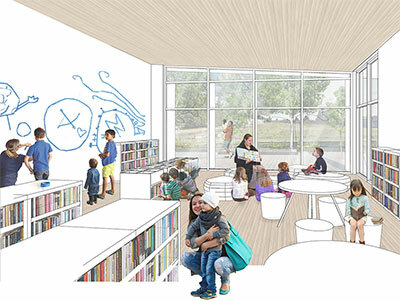 The community’s vision for the Future Library is reflected in the building program, site plan, schematic floor plan, and conceptual images prepared by the architects. The new library is sized to eliminate current crowding and support growth well into the future. It includes key design elements that the community said were essential. Click here for the complete report on conceptual planning. As a part of conceptual planning, detailed construction cost estimates were prepared. These estimates were used to determine the level of project funding required. The estimated total cost of the library project is approximately $13,400,000. Financing for the Future Library will include funds from NOLS’ capital reserves ($1,000,000) and, if the November 2018 ballot propositions are approved by voters, tax supported bonds of up to ($12,400,000). Additional funds received through local fundraising, gifts, and donations will be used to further enhance the basic design. Why is a bigger library needed? The Sequim Branch was built in 1983, to serve a population of around 14,000. The Branch is undersized for the current and growing population of almost 30,000, and the building infrastructure is outdated. There has been a generally acknowledged need for a larger, modern library for at least two decades. Read more about the project background. What will the new library have that the existing library doesn’t? The new building will be a 21st century library, designed and built to be sustainable, operationally efficient, and adaptable for decades to come. The new library will include more space for everything: books, technology, seating, tables, programs, and events. More space also allows for separation between social and quiet activities, and functional design that supports operational efficiency. Children, families, teens, tweens and people of all ages, will have access to facilities and spaces that support their age related needs and interests. In recent decades the information world has shifted from physical to virtual, individual to community, collections to creation, archival to portal, and public libraries have transformed themselves to meet these social and technological changes. The expression “21st century library service” refers to the evolving way libraries provide innovative resources and services to meet modern needs for education, information, and personal development. A 21st century library utilizes the latest technology, circulates eBooks and downloadables, loans e-devices, and provides technology support and hands-on individual instruction in tech skills. At the same time, the 21st century library responds to changing social relationships and expectations by playing an increasingly important role as a community hub, nurturing hands-on exploration and creation, and supporting real social connection — in an increasingly virtual world. How busy is the Sequim Branch Library? The Sequim Branch is a busy place. 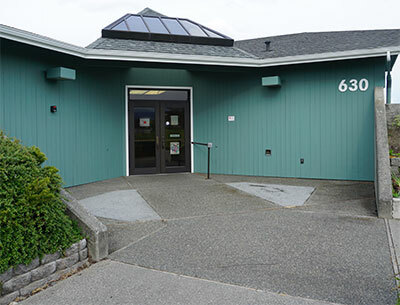 Although it is five times smaller than the Main Library in Port Angeles, Sequim Branch use statistics for checkout, customer visits, and community meeting room use are surprisingly comparable. Comparative usage data for all the NOLS branches is published in the Board Packet each month, which can be found on the library’s webpage. What services can I get from NOLS? Free access to public computers, books, community meeting rooms, WiFi, iPads for borrowing, internet access, art exhibits, training in media literacy, coding, robotics, MOS certification testing, Lynda.com, volunteer opportunities, help with online job searching, copies, printing, auto repair info, telescopes, tax forms, reading support, teacher support, storytimes, literacy, percussion kits, free National Park passes, deliveries to the homebound, and so much more. . .
Click here for a look at the many services available. NOLS is a Library Tax District as defined by RCW 27.12. The majority of NOLS’ operating revenues come from property taxes. Much smaller funding sources include timber excise taxes, donations, grants, investment interest, fines and fees. Read more about NOLS’ budget and levy. In November 2018 voters in the area served by the Sequim Branch Library will have the opportunity to approve or reject two ballot propositions to support construction of a new, larger library. Proposition No. 1 creates the Sequim Library Capital Facility Area (SLCFA) tax district. Proposition No. 2 finances the project by approving bonds and tax levies. Registered voters in the proposed SLCFA tax district will have the opportunity to vote. The SLCFA district encompasses the area of Clallam County served by the Sequim Branch Library – extending from the county line on the east to Blue Mountain Road on the west. 2018 general election ballots will be mailed on October 17. Ballots are due on Election Day, November 6. Click here for information on how to register to vote. The last day to register is October 9, 2018. What will the ballot language look like? Click here to read the ballot measures. A Library Capital Facilities Area (LCFA) is the method Washington State law provides for funding a public library capital improvement project through property taxes. An LCFA can be used only for financing the construction of the library capital facility. A library capital facility includes land, buildings, site improvements, equipment, furnishings, collections, financing, design, construction, equipping, remodeling and all necessary costs related to acquisition. Once a library capital facility is paid off, the LCFA is dissolved. Read more about NOLS LCFA decision process here. What happens if ballot measures pass? What happens if either ballot measure does not pass? How much will the new library cost? The estimated total cost of the library project is approximately $13,400,000. Project funding includes $1,000,000 from NOLS’ reserves. Read more. Proposition No. 2 authorizes issuance of 21-year bonds for up to $12,400,000, and property tax levies to repay those bonds. The bonds will be authorized for up to twenty-one years. No. It will vary somewhat year to year, dependent on the assessed valuation of the property, and other factors. Are there any exemptions to the proposed property tax? The State of Washington has a property tax exemption program. The program is available to taxpayers who are, on December 31 of the year before the taxes are due, at least 61 years of age or older; OR retired from regular gainful employment by reason of disability; OR a veteran of the armed forces of the United States entitled to receiving compensation from the US Department of Veteran Affairs at a total disability rating for a service connected disability. How much is the Library contributing to this capital project? The NOLS Board of Trustees has designated use of up to $1,000,000 from Library reserves to supplement bond funds, if the ballot measures are approved. This amount represents approximately half of the reserve funds NOLS has set aside to support capital projects and maintenance at all NOLS facilities. NOLS will also support collection expansion using operating and gift funds. Didn’t we already vote for a new library in 2010? You may be remembering the 2010 “levy lid lift,” which was about library operations and services, not a library building. In 2010 citizens county-wide voted to restore NOLS’ operating levy, which had eroded over time to 33¢/$1000 of Assessed Valuation, to the 50¢/$1000 originally approved in 1978. The 2018 Sequim LCFA vote is specifically about funding a new branch library building in Sequim, and only voters living in the area served by the Sequim Branch Library will have the opportunity to vote. Didn’t I already pay for the expansion of the Port Angeles Library? Unless you own property located in the City of Port Angeles your taxes did not support the 1998 expansion of the Main Library, which is located in Port Angeles. Those bonds and levies were approved and paid for only by Port Angeles residents. In addition to providing library service in Port Angeles, the Main Library also houses many resources, departments, and functions that support library service at the other three NOLS branches, including Sequim. The Port Angeles Library bonds were paid off and retired in 2015. Will more staff be hired if a new building is built? In many ways the existing building is quite inefficient to run, because it is not designed for 21st century services, and the crowded conditions and lack of storage space prevent effective work flows. An absolute requirement of the Future Library design was that it must support efficient and cost effective operation, and not include any design elements (such as a second floor or other separated library space) that would unnecessarily increase staffing requirements. The new building is functionally designed for effective workflow and energy efficiency. The single story design and clear sight lines make it easier for staff to monitor activities throughout the building from the centrally located customer service desk. That said, if a new and larger library is constructed, it will be used more, which will most likely increase staffing requirements. In planning for the Sequim Branch Future Library project NOLS has anticipated these associated operating cost increases. Read more. Can’t you make the project cheaper? NOLS believes the community should have the opportunity to vote on funding the library it asked for. The conceptual plan reflects the library that the community envisioned through a series of public input activities. Expert cost estimating was applied to the conceptual plan to determine the project costs, and develop the funding plan. A cheaper project would not be the project the community envisioned. Why do communities still bother building or expanding libraries? Hasn’t the internet made libraries a thing of the past? Numerous studies, well supported in Clallam County by local usage data, confirm that public libraries continue to be a strong and vital component of their communities. Libraries have adapted well to a changing society, and continue to meet community needs in new and innovative ways, including internet access, digital resources, help with internet navigation, and tech skills training. Books and reading also remain as popular as ever, and libraries as community hubs that nurture social connection, in an increasingly virtual world, are highly valued. Despite the changing face of library service roles, library buildings remain essential to the library’s ability to meet community needs and expectations, and will continue to do so in the future. Public libraries are unique in many ways. The “live load” capacity of a public library is about 150 lbs. per square foot, more similar to warehouses than offices or schools. Furnishings and equipment must be able to withstand heavy public use for an extended time, and of course technology infrastructure is expensive. The cost per square foot estimate for the proposed Sequim Library project is $456/sf, somewhat lower than costs per square foot for many library projects. What about money invested in the remodel done in 2009? In 2009 NOLS and the Friends of Sequim Library, together with funding from a designated bequest, undertook a moderate remodel to address some long deferred capital maintenance issues, and generally to make the very shabby facility more comfortable, attractive, and operationally functional, until a longer term solution could be found. Care was taken not to unnecessarily over-invest in infrastructure that might not be needed for the long term. The total cost of the 2009 remodel was approximately $500,000, with about $60,000 of that amount related to decommissioning the old septic system and getting the library hooked up to City sewer lines – a capital investment that will carry forward to support a new facility. If the ballot measures pass, when will construction start? The projected start for the project is mid-2019. Construction design, to add necessary construction details to the conceptual/schematic design, would be the first thing to happen after selection of the project architects. If the ballot measures pass, when will the new building open? The construction project is expected to take approximately one year, so the new library would most likely open in mid to late 2020. Where will I go for library service while a new library is being built? The library site will be inaccessible to the public during construction. NOLS will temporarily move library services to a “pocket library” at another location somewhere in the Sequim area. Of course, the other NOLS branches will continue to operate as usual, and Sequim area customers will, as always, have the option of using other branches instead of, or in addition to, the pocket library in Sequim. How was the public involved in planning for the new library? Over the years NOLS has fielded several community taskforces, community based studies, and conducted surveys, to explore options and solicit public input on the future of the Sequim Library. During the recently completed conceptual planning project, three public events specifically involved the community in developing the vision for the Sequim Future Library plan that underlies the current ballot measures. On the NOLS-owned site at 630 N. Sequim Ave., which is close to schools and downtown. The proposed building is about 17,000 square feet, approximately 2.8 times the size of the 6052 square feet of the current facility — sufficient to serve the growing community decades into the future. Why not expand the current library rather than building a new one? Site and architectural analysis revealed that the size of the existing building, and its location on the site, would have required partial demolition, in order to provide required access to required parking. For this reason the potential cost savings in a re-use option were less than the expanded building. Due to the age and construction of the building, it was also very likely that additional unexpected costs would have arisen during demolition/remodeling. Apart from cost considerations, an expansion/remodel plan would also have required compromising service in some important ways, including access, collection layout, functionality, solar optimization, and support for technology infrastructure. The NOLS Board considered all these factors, and ultimately accepted the recommendations of the community based review committee, that building a new library was the better approach. You can read the full report on the analysis and review process here. Did the library ever consider buying land somewhere else in town and building from scratch? At various points during the extended planning for a future library, NOLS explored other sites, and also discussed various joint use site possibilities. Location, parcel size, cost, improper zoning, bad timing, and public facility access issues, were some of the reasons these alternatives proved less feasible than staying on the existing, well located site, which is already owned by NOLS. Conceptual planning produced schematic designs that allocate the proposed size, internal components, general aspect, and site relationships for the new Library. If the ballot measures pass, the specific look (as in architectural style, finishes, paint, etc.) will be finalized during construction design. As with the conceptual design phase, community input will be integral to this final phase of planning. A complete report on the conceptual design project is available here. So what do these schematic designs look like? Click here for a look at captioned views of the site plan, the interior floor plan of the Future Library, and a gallery of architectural perspectives. Will the meeting room be larger? Yes. The conceptual design includes a large community meeting room (1600 sf) that can be divided into two smaller meeting rooms — or expanded into the casual gathering space in the lobby, to accommodate even larger crowds. An additional multi-purpose area supports library programming for youth, allowing the public meeting rooms to be more frequently available for community based meeting and events. Small conference and study rooms, and a quiet reading room, support the needs of students, teachers, and readers. Currently the library has 28 parking spaces. The new library will have 62 spaces, with better provision made for pedestrian access to the building and drive-through book drops. Will there be more books and other collection materials? Yes, the new library floorplan has room for a collection that is about 12% larger than will fit in the current building. NOLS operational funds and gift funds will be used to expand the collection to fill these additional shelves. Wouldn’t a two story building have saved space on the site? Two story libraries are more expensive to build and to operate. A two story building would have required adding a lot more staffing – an operational cost that would continue for the life of the building. The site is adequate to support the 17,000 sf building, as a one story building. Are there any green design elements or outdoor spaces? Solar optimization in the conceptual plan supports passive solar advantage. Additional green features may be incorporated during construction design, if additional funding for such enhancements is found. The Library repeatedly heard from the community that connection to the outdoors is important in library design. The conceptual design includes views in/out of the library, and easy access to outdoor social and programming spaces, both covered and open. 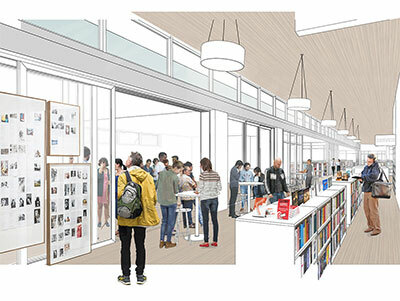 What will the Friends of the Library space in the new Library be like? Approximately 400 sq. ft. of dedicated space for FOSL operations has been allocated within the library, supported by extensive access to other flexible-use library spaces that can be utilized by FOSL for various activities. As with planning for the rest of the library, FOSL support spaces within the new library are designed to be flexible, adaptable, and operationally efficient. The FOSL workroom has paved, drive-up delivery access, for easy drop off of donations to a secure, monitored delivery area. Sorting and sale spaces utilize modern library furnishings and equipment, such as rolling book carts and compact shelving, to reduce the need for the repeated lifting of boxes that is so much a part of current FOSL booksale operations. The functional challenges of ramps, gravel walkways, stairs, narrow aisles, limited room capacities, and numerous separate and unheated outbuildings are also eliminated. Utilizing the ample space available in the library meeting rooms and lobby for periodic/monthly sales means no more long lines of customers waiting in the rain (or hot sun). Book sorters and book sale customers alike have convenient access to restrooms. The conceptual design site plan also allocates space for future construction of a large 1500 sq. ft. free-standing FOSL building directly off the east end of the parking lot, should FOSL wish to pursue that option at a later date. It is important to note that, due to the relative size and location of the existing library building, the existing FOSL outbuildings, and site requirements related to access and expanded parking, there is simply no scenario in which the Sequim Branch can be expanded to adequately meet community needs without displacing FOSL booksale operations (and library operations) from the current location. You can read more about future Friends of Sequim Library opportunities – and challenges–in the article published in the July 2018 FOSL newsletter. You can view the schematic floor plans and site plans here. NOLS looks forward to continued collaboration with the Friends of Sequim Library as we work to envision, design, and implement the operational approach to book sales and other Friends-sponsored events that will work best for everyone in the Future Library. What will happen to FOSL booksales while the new library is being constructed? The library site will be inaccessible to the public during construction. NOLS will temporarily move library services to a “pocket library” at another location somewhere in the Sequim area. To the extent possible, NOLS will make provision for FOSL to continue book sales, in some form, at the temporary library site. The exact nature of FOSL’s presence will depend on the nature, size and location of the temporary site. FOSL may also decide to make other temporary off site arrangements of their own. As it will appear on the November 6, 2018 ballot. The Clallam County Board of Commissioners adopted Resolution No. 69, concerning the establishment of the Sequim Library Capital Facility Area. If this proposition is approved, then the Sequim Library Capital Facility Area will have boundaries coextensive with the Clallam County Park and Recreation District No. 1; and it will have all the powers provided in chapter 27.15 RCW, including the power to construct, acquire, maintain and remodel library capital facilities. Shall this proposition be approved? The Clallam County Board of Commissioners adopted Resolution No. 70, concerning a proposition to finance a new and expanded library. This proposition, if approved, will authorize the Sequim Library Capital Facility Area to construct, furnish and equip a new library in Sequim; to incur indebtedness to finance such improvements through the issuance of up to $12,400,000 in general obligation bonds maturing within 21 years; and to levy annual excess property taxes to repay such bonds. Shall this proposition be approved? considerations related to other local public funding efforts and public perceptions. Halt active work, during 2019 and 2020, on activities related to passage of a bond measure to fund expansion of the Sequim Branch library. Other issues related to cost, timing, and other pertinent factors. The motion further noted that unexpected events could influence this decision, and that staff and Board should remain generally aware of changing circumstances, and open to re-initiating action at some earlier date if circumstances warrant. The cramped and outdated Sequim Branch remains a pressing concern for NOLS, but after careful consideration of many factors, the Board ultimately decided to step back… from active work on the Sequim Future Library project until at least 2021.